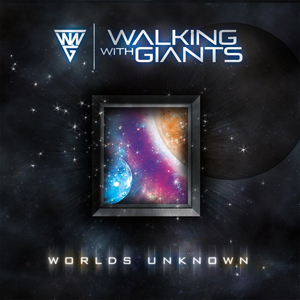 The debut album from WALKING WITH GIANTS, Worlds Unknown, is available through all digital retailers this Friday. Fans can order the digital album via iTunes at http://tinyurl.com/WWGiTunes or through Amazon at http://tinyurl.com/WWGAmazon. The album is also available in various physical configurations that include a signed CD, bonus tracks, and a t-shirt. These various bundles are available through singer/guitarist Gary Noon’s own WALKING WITH GIANTS, LLC Records at http://wwgstore.bigcartel.com. Worlds Unknown finds Noon teaming up with SEVENDUST guitarist Clint Lowery, drummer Morgan Rose and ALTER BRIDGE bassist Brian Marshall who got together in the summer of 2015 to write and record the debut full-length. Worlds Unknown was produced by Clint Lowery. An official music video for the track “Heavy Hand” is available and can be seen on KNAC.COM right HERE. The video shows WALKING WITH GIANTS in the studio creating and recording Worlds Unknown. WALKING WITH GIANTS has also been sharing the studio experience through exclusive behind-the-scenes videos releasing one each day leading up to release date this Friday. The videos show the band in the studio recording and the sessions that became the debut album. The first seven episodes can be seen here: https://www.youtube.com/wwgiantsofficial. The eighth and never before seen video will be available on January 15th, 2016. WALKING WITH GIANTS was started in 2013 by singer/guitarist Gary Noon. Noon’s original intention was to create a tribute band to his two musical influences: SEVENDUST and ALTER BRIDGE. Through an introduction by a mutual friend, Noon met Clint Lowery and a musical bond was formed. This bond led to the release of a self-titled EP in 2013 in which ALTER BRIDGE drummer Scott “Flip” Phillips was recruited to play drums. The One By One EP (taken from an ALTER BRIDGE song title) brought bassist Brian Marshall into the fold and Noon has not looked back since. The plan is to take WALKING WITH GIANTS on the road in 2016 with a myriad of players, but keeping the core players from the Worlds Unknown sessions for the studio recordings.